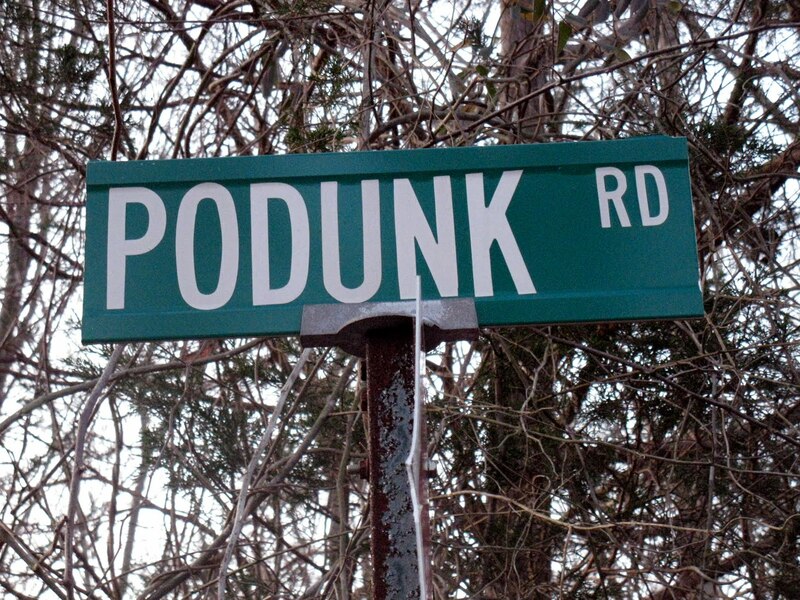 "This is the most podunk town I've ever been to - there isn't even a traffic light." "He's from some podunk place upstate, so you really can't judge him on his fashion sense." "legendary small town, 1846, originally the name of a small group of Indians who lived around the Podunk River in Connecticut; the tribe name is in colonial records from 1656 (as Potunck), from southern New England Algonquian (Mohegan or Massachusetts) Potunk, probably from pautaunke, from pot- 'to sink' + locative suffix -unk, thus "'boggy place.' Its popularity as the name of a typical (if mythical) U.S. small town dates from a series of witty 'Letters from Podunk' which ran in the 'Buffalo Daily National Pilot' newspaper beginning Jan. 5, 1846." hm... i think i'm going to use this word now. "I am from a podunk town that is so small it doesn't even have it's own post office so it uses another town's post office called 'Street.'" true story.